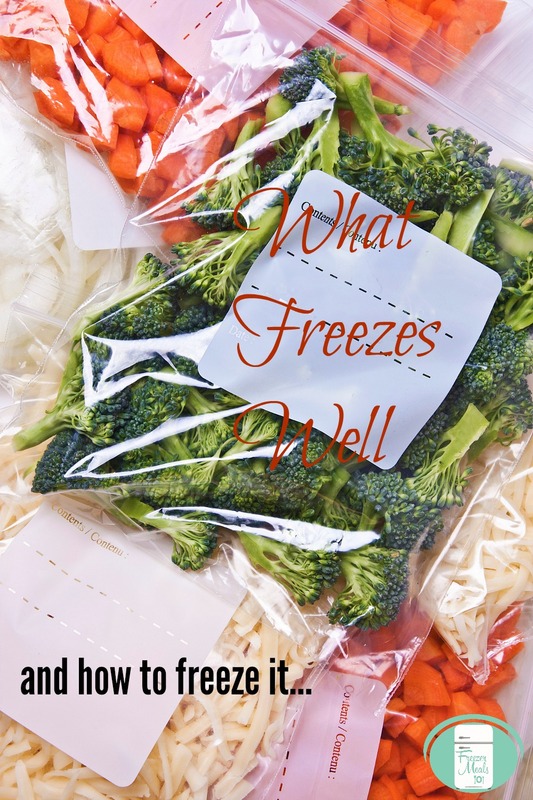 Whether you are new to making freezer meals or not, you may wonder what freezes well and what doesn’t. I’ve created this reference to help you determine not only what freezes, but also how to best freeze it. I’m also including some tips on adapting freezer meal recipes if the ingredients required don’t freeze well. Butter, margarine – Freezes well. Milk in a jug – Freezes well. Milk – Doesn’t freeze well in recipes, however recipes that call for milk can be adapted easily for the freezer by using evaporated milk or heavy cream in its place. Sour Cream – The texture changes when frozen, but it holds up well when in cooking or baking. Yogourt – The texture changes considerably when frozen, but it is still fine for using in smoothies. You can freeze in ice cube trays and add to resealable freezer bags to put into smoothies. Cheese – Shred it first and seal well before freezing. Cream Cheese – The texture changes when frozen as it is, but when mixed in a recipe it is fine. Cottage Cheese – Freezes well within a recipe. Custards – Do not freeze well. Eggs (raw) – They need to be taken out of the shell first and mixed with a bit of salt or they will be rubbery. Eggs (cooked) – Scrambled or cooked eggs freeze well, but hard boiled eggs get rubbery. Ground meats including wild game – Package and seal well to prevent freezer burn. Beef – Package and seal well to prevent freezer burn. Chicken – Package and seal well to prevent freezer burn. Chicken freezer burns easily unless it is in a marinade or within a freezer meal recipe. Pork – Package and seal well to prevent freezer burn. Seafood – Package and seal well to prevent freezer burn. Luncheon Meat – Package and seal well to prevent freezer burn. Melons, lime, lemon, grapefruit – Do not freeze well. Fruit juices including lemon, lime and grapefruit juice – Freeze well on their own or within recipes. Oranges – Do not freeze well, but segmented orange sections do freeze well within recipes. Grapes – Can only be frozen if you are planning to eat them frozen. Apples and pears – Core, peel and slice, then place in lemon juice in re-sealable freezer bag to keep from browning for use in future baking. Peaches – Peel, pit and slice peaches and place in resealable freezer bag for use in future baking. Berries – All berries freeze well. Cucumbers, lettuce, sprouts, and radishes – Do not freeze on their own or in recipes. Celery, peppers and onions – Do not freeze well on their own, but work well within recipes. Mushrooms – Can be frozen if sauteed first or if used in recipes. Potatoes – Do not freeze well unless already frozen. Frozen hash browns and tater tots work well within recipes. *A note about vegetables: Vegetables such as broccoli, peppers, asparagus, green beans, brussels sprouts, carrots, cauliflower, peas, spinach, zucchini, freeze better when blanched first. Herbs – Freeze in ice cube tray with small amount of water and once frozen, place in resealable freezer bag. Nuts – Freeze fine if sealed well in a resealable freezer bag. Baking chips – Seal in resealable freezer bag. Loaves such as zucchini loaf or banana bread – Freezes well. Buns – Plastic wrap before putting in freezer bag to prevent freezer burn. Cooking or brownies – Package and seal well to prevent freezer burn. Cookie dough – Place pre-formed balls on cookie sheet in freezer until frozen and then place in a resealable bag and put back in freezer. Pizza dough – Freezes well. Pie dough – Freezes well. Waffles and pancakes – Place on cookie sheet flat in freezer until frozen and then place in a resealable bag and put back in freezer or place wax or parchment paper in between. Waffle, pancake and muffin batter – Freezes well. Pasta – Freezes if cooked to al dente (slightly undercooked). Rice – Freezes best if slightly undercooked. Broths and Soup – Freeze well. Sauces – Most freeze well, but some that have a thickener such as flour or cornstarch will separate. 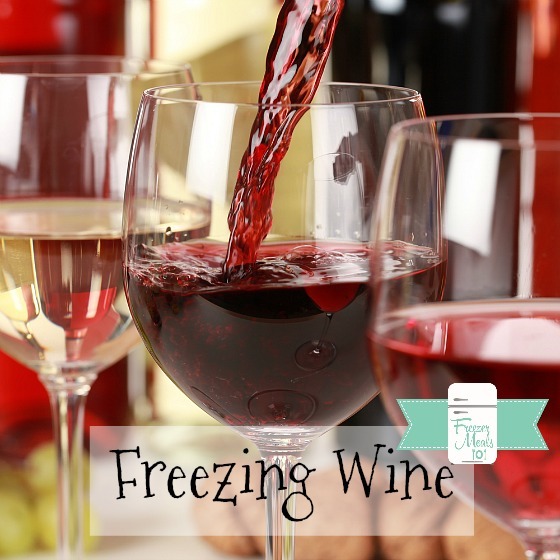 Wine – Pour leftover white or red wine into an ice cube tray and then place frozen cubes in a resealable bag to be added to soups or sauces. It adds depth to dishes such as pasta sauces and chili.